Carlos Cruz-Diez moved from his native Caracas to Paris in 1960, where he still lives and works. He is a major protagonist in the field of kinetic and Op Art, a movement based on "an awareness of the instability of reality." Inspired by such artists as Georges Seurat and Josef Albers, his work focuses on the kinetic energy of color and its existence as an autonomous and evolving reality, independent from form or structure. Much of his work, in particular his Physichromie series, is created by plotting lines of contrasting color alongside each other, creating an illusion of movement as the viewer's position relative to the artwork shifts. 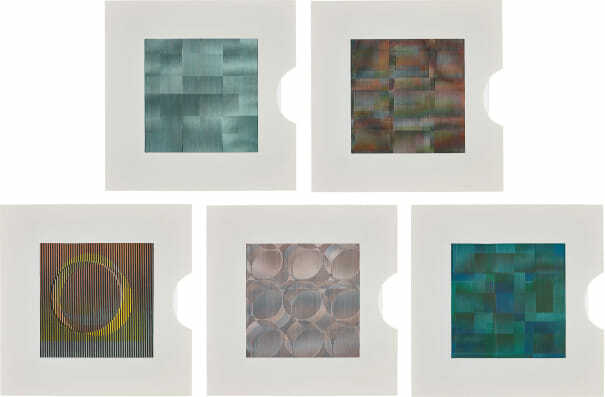 The complete set of five manipulable screenprints in colors, on light wove paper and on clear acetate, with full margins, in cardboard sleeves, with title page, colophon, and artist's texts, contained in the original card portfolio box with printed title. Signed with initials in black ink and stamp-numbered '184' on the colophon, from the edition of 250 (there were also 10 sets reserved for libraries), published by Éditions Denise René, Paris (with their blindstamp), all unframed.